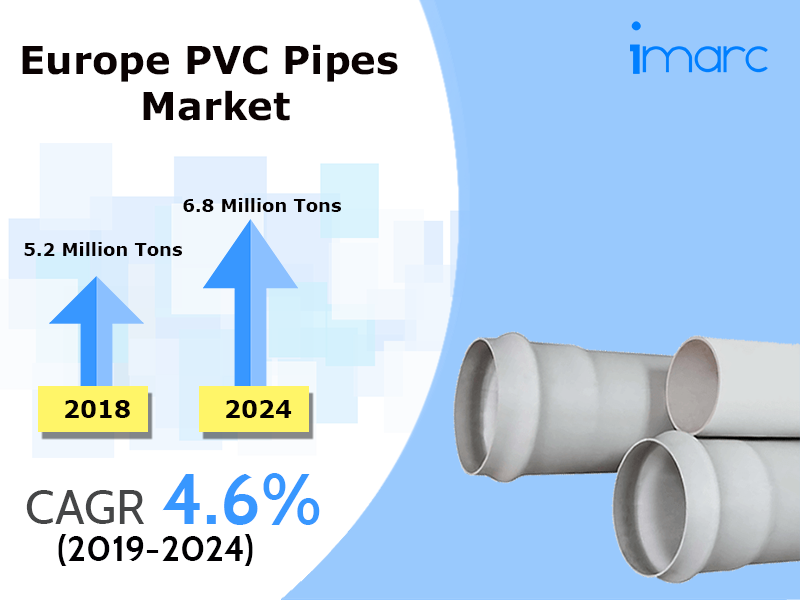 The latest report by IMARC Group, titled “Europe PVC Pipes Market: Industry Trends, Share, Size, Growth, Opportunity and Forecast 2019-2024”, estimates that the Europe PVC pipes market reached a volume of around 5.2 Million Tons in 2018. PVC is a widely used thermoplastic which is made up of 57% chlorine and 43% carbon. PVC pipes find a wide range of applications primarily in the construction sector. They are also used for sewage, construction and electrification purposes. These pipes are resistant to chemicals and high fluid pressure which makes them fit for distribution of potable water. They are used for renovation and often substitute traditional materials like wood and metals. PVC pipes are not only durable and light in weight but are also cost-effective and easy to install. Their high degree of inertness and resistance to corrosion makes them an ideal choice for use in earthquake-prone areas. Due to a steady revival in the construction sector in the European region, the demand for PVC pipes has been increasing at a rapid pace. In addition, these pipes are preferred for the transportation of drinking water as they are resistant to bio-film contamination. They eliminate the risk of breeding bacteria which helps in providing clean water. Moreover, as PVC pipes are long-lasting, require minimum maintenance and can be recycled, they assist in reaching the sustainable goals set by various European countries and organizations. For instance, around 50,000 tons of PVC pipes are recycled in Europe every year through VinylPlus, a voluntary program of the European PVC industry committed to sustainable development. Apart from this, increasing disposable incomes in the region along with an increase in housing demand, especially in the central and eastern European countries, are also driving the market. Owing to the aforementioned factors, the market volume is projected to reach 6.8 Million Tons by 2024, registering a CAGR of 4.6% during 2019-2024. On the basis of applications, sewage and drainage represent the largest segment accounting for more than two-thirds of the total application share. Other application segments include gas supply, industrial, agriculture, drinking water and others. Region-wise, the market has been segregated into Germany, Italy, the United Kingdom, Spain, France and others. Currently, Germany is the largest regional market. The competitive landscape of the Europe PVC pipes industry has also been examined in the report. The profiles of the leading players operating in the market have also been provided.